Perhaps this post should be called tribulations and trials. I rode over to Norms this arvo to primarily play with learning how to start the 1953 500 JS as well as changing the oil on my 94 Bullet. Not far from Norms my gear box started playing up and I pulled the cover off the gear box and discovered a broken gear selector spring. Norm removed a gear spring from the 53 Meteor gear box and put it in mine. I drained the fuel from my petrol tank as I had switched to reserve on the way and wanted to know how much fuel was left in the tank. Norm changed the oil and put in a new filter. After adjusting the gear box I left to ride home. I stopped in at a petrol station to fill the tank, I had 4.5 litres of fuel left and filled the tank with 12.5 litres of fuel. I thought my new tank was at least 18 litres, I must have miscalculated. I was also not very observant and did not notice that the rear bolt on my petrol tank was loose. I took off and turned on to the freeway. The motorcycle was riding well and the gears were changing very nicely. About 15 kilometres down the freeway I noticed the engine was getting noisier. After 25 kilometres I pulled off the freeway and looked down at my engine and saw fuel leaking from the tank. I rode the motorcycle another 4 kilometres home, siphoned off the remaining fuel and put it in my old fuel tank. The rear bolt holding the tank on the frame had come loose, losing one of the nuts. Consequently with the vibration of the engine the tank developed a leak. I do not know at this stage whether it is repairable or not. The new tank is still on my motorcycle and I will remove it tomorrow and put my old tank back on. Here comes the return of the red bike. Such a frustrating day, having sorted out the gear box and in fact improved gear selection, having changed the oil and oil filter and then having put a hole in my new petrol tank. 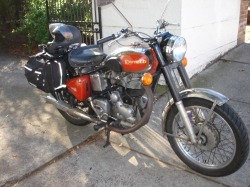 Typically it was a very Enfield kind of day, if you ride an Enfield you will know exactly what I mean. When I fitted the new tank (see pics) I also fitted a new locking petcock. I have found that when the fuel runs low and I have to switch to reserve the engine runs roughly for a while as if starved of fuel. After 3 or 4 minutes the engine runs normally again. I am not sure why this happens. At the moment I am getting approximately 320km before reserve. I will have to carry a litre of petrol and test how far I get on reserve, worthwhile knowing I reckon particularly in for a long trip. I have done some research in to helmet cams as I wish to video the WA 2010 ride. I will post my research soon.